The Chinese New Year holiday starts from the 30th of January and continues until at least the 2nd of February. This makes large moves and high volume improbable during this period, as there will be no policy news from the Chinese government at this time. The deadline is also on a weekend, which means the western exchanges will also have less trading volume than average. Given the tense atmosphere surrounding this deadline, the market will be more susceptible to manipulation, as it will be difficult to differentiate between genuine market movements and manipulative action from whales. The Bitcoin market is relatively new and inefficient, and hence sufficient safeguards against market manipulation must be taken. The high anticipation of this deadline also means that news from other parts of the world will continue to be ignored on the market, until about a week into February, when this Chinese matter is fully resolved. 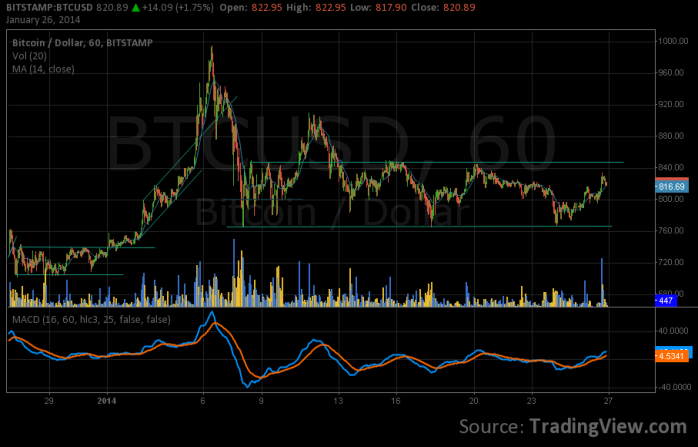 Currently, the market price is still moving in the $765 to $850 range, that was set in the beginning of January. The downward breakout that was predicted here last week did not materialize. Given the nearing deadline, a new approach must be taken to the market. Most of the money in the market is currently waiting safely on the sidelines, awaiting the end of the current Chinese uncertainty. If the deadline passes uneventfully, the price might begin to drift upwards gradually, as more and more investors regain confidence in the market. After about a week from the deadline, the rest of the investors might jump in, resulting in the start of a new bullish rally, which finally breaks the range we are currently in. This also means that the price is not expected to leave the current range until a few days after the deadline. Since more bad news is not expected from China, the price is expected to go up after the deadline as conservative investors retake their long positions in the market. Upward resistance is expected at $910, $945 and $995. Its current price for bitcoin is floating around 1000usd mark. It has huge market volume and the owner is troubled with lawsuits. They do not have dollar stock so people with dollar account cant withdraw and cash from Mtgox. Therefor they buy btc for 30% more expensive compared to stamp. China problem is not actually a problem since the law got into order month ago. Yet mtgox is happening right now. MtGox customers are not selling their BTC and cashing out because it’s not practical to cash out any longer, and it hasn’t been so for a couple of months now. That’s why the price is so high there, it reflects the premium people are willing to pay for a chance to get out of MtGox. The price there is not going to “crash” until MtGox solves its withdrawal and liquidity problems. In fact until such time, the price there is going to continue to increase as investors become more and more desperate to exit MtGox and take their coins to another exchange. MtGox has been a dying exchange since mid-November due to its withdrawal problems and bad trading interface. There is hardly any volume left there, on a daily level it has about as much volume as Bitfinex. There is nothing really new about this current increase in its price vis-a-vis other exchanges; this just reflects a growing realisation of this fact, as more and more people buy BTC in Gox, hoping to transfer it to other exchanges at a small loss. This BTC buying drives the price even higher, making it more unprofitable for the rest of the people at MtGox to transfer their money out. Those who haven’t done so already should do it as soon as possible, whatever the price difference is. The last users stuck on MtGox will probably lose their money because of the exchange’s well known liquidity problems.